With recent statistics revealing that faulty brakes caused the most accidents out of all mechanical defects in 2017, Rob Marshall looks at its fluid requirements and how you can protect your customer against total brake failure. ever, the post-May 2018 changes added checking for fluid contamination, which is not always that easy to inspect – removing a master cylinder cap is not permitted and many fluid reservoirs are not see-through. Therefore, as the MOT standards cannot guarantee sound brake fluid condition, you have to pick-up the dropped baton come service time. Brake fluid is remarkable. Not only does it transfer forces from the pedal and ABS/ESP module to the calipers and wheel cylinders, it also faces the difficult task of absorbing some of the immense heat created by converting motion energy into heat, while neither boiling, nor evaporating. 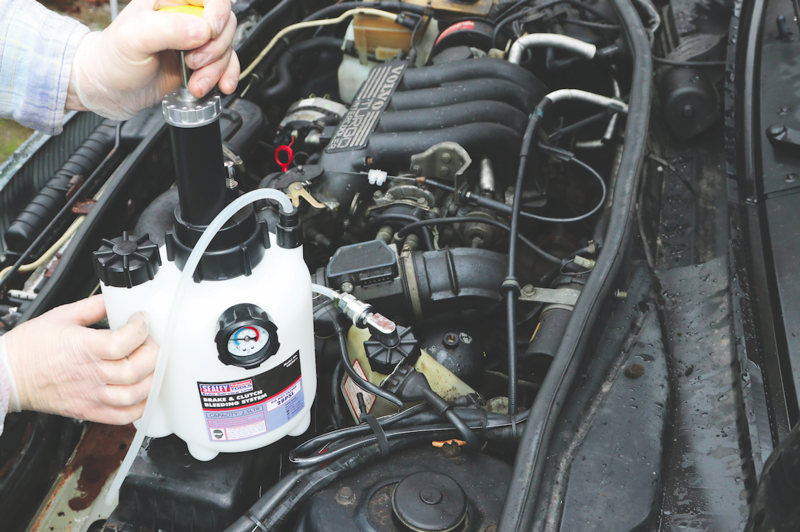 While compressor-fed tools are available, hand-pump equipped one- man bleeding kits have entered the market that pressurise the braking system up to 30psi and top-up the reservoir automatically, while you work beneath the car. Unfortunately, the requirement of a low-cost glycol-based fluid to have a high boiling point is traded-off by its affinity for moisture, which seeps into the braking system through not only the breather hole in the master cylinder cap but also via the flexible rubber brake lines. Naturally, the presence of water reduces the solution’s boiling point, creating a safety problem. 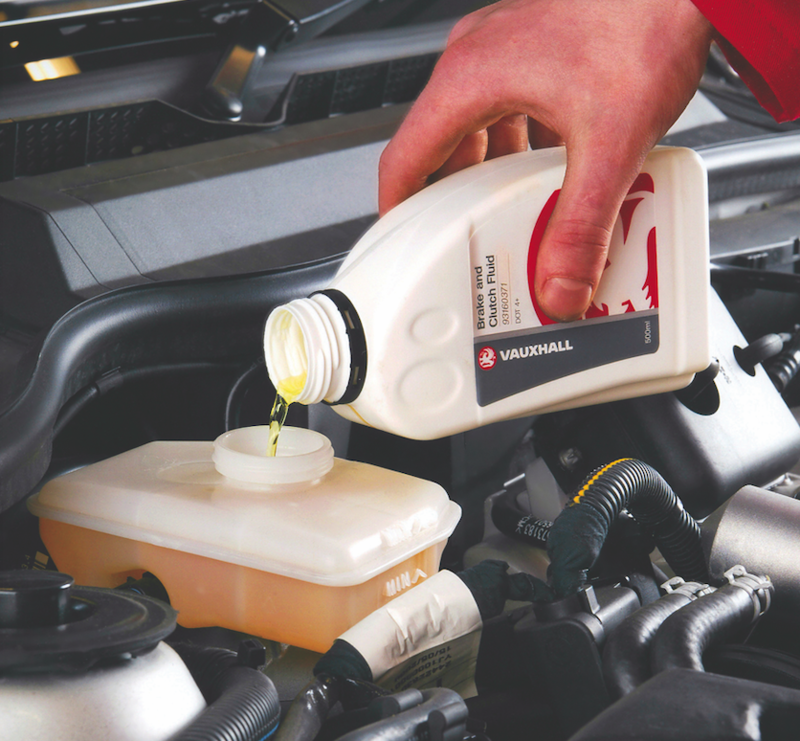 As with water in a kettle, boiling brake fluid introduces air bubbles. As pressure cannot be transferred any longer by the fluid, as the bubbles compress, the brake pedal will sink to the floor and the hydraulic braking system will not operate. It is fair to say that, aside from panicking, most drivers would not have a back-up plan, if confronted with such a scenario. (for the first time especially) is a pertinent safety check and highlighting the result to the customer should build trust that you are looking after their safety and not scratching for extra work. Yet, as respected brake component manufacturers and retailers state, it will help you generate sales opportunities that are in both your and the customers’ interests. Naturally, other braking system components should be part of your inspection process, should you suspect that it has not received attention for some time. Textar states that brake fluid should be replaced every two years and the company has been quoted as saying that brake servicing business, which results from using an accurate fluid tester, can generate considerable annual profit for an average-sized aftermarket garage. 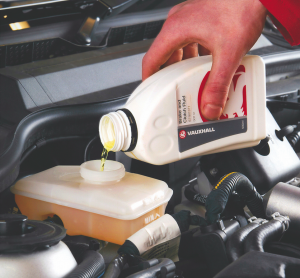 While brake fluid specifications are becoming more bespoke, aftermarket suppliers can offer OE quality parts that obviate you being at the mercy of a main dealer’s part counter. Just as you would not employ an incompatible engine oil, use brake fluid that complies with the specification set by the car manufacturer. The most often highlighted difference between DOT 3 and 4 fluids is in their dry boiling points, meaning that the superior DOT 4, which has a minimum dry boiling point of over 229 degrees Celsius, as opposed to over 259 degrees, can be used in a DOT 3 system. A little confusingly, DOT 5.1, which was introduced first by TRW (part of the ZF group) in 2014, possesses the same boiling point as DOT 4 but with lower viscosity. Interestingly, TRW sells a DOT 4 LV (Low Viscosity) fluid that is even more free- flowing than DOT 5.1, which it states is suitable for heavy, high performance cars. DOT 5 is a completely different proposition. 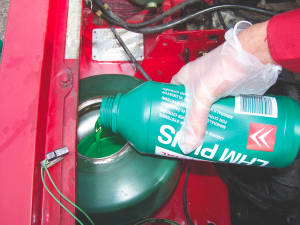 Being silicone-based fluid, rather than glycol, it not only maintains the boiling points of DOT 4 and 5.1 fluids, while not absorbing water, but is also non-injurious to paintwork and does not possess a limited storage life. Yet, some sources state that because it is more compressible, it risks affecting the efficiency of ABS and ESP anti-skid systems, which limits its use to older kit cars and classic cars. Never use brake fluid in a car that requires a mineral fluid. 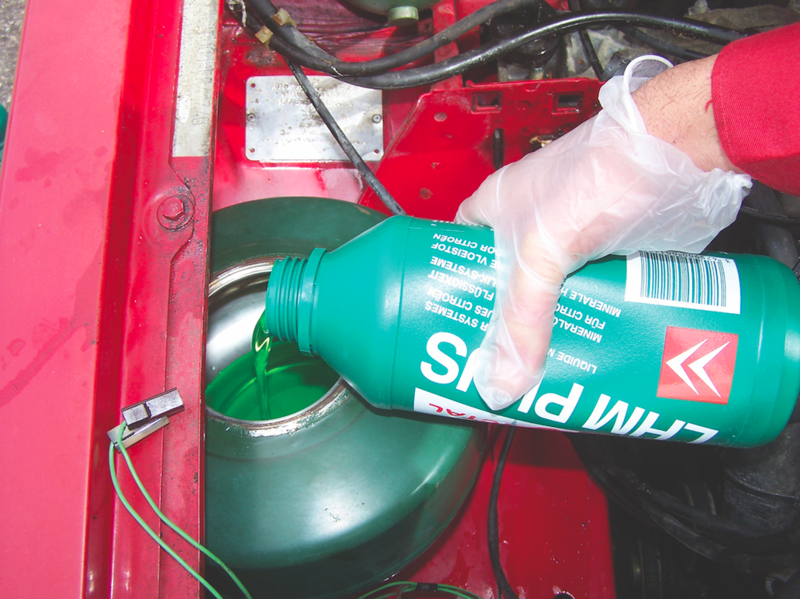 LHM/LHM+ fluid, for example, tends to be bright green but old LHM turns a yellowy-brown hue, which may confuse you into thinking that brake fluid should be used. Additionally, changing all rubber seals in the hydraulic system tends to be recommended. Yet, John Smith from Automec of Buckinghamshire has been selling DOT 5 since 1982 and states that all of these facts are untrue and all cars can be converted, other than those that use mineral fluids in their braking systems (limited mainly to pre-2001 Citroën and Rolls Royce models). Should you wish to research the issue in more detail, check the compressibility specifications in the DOT standards, between DOT 4, and DOT 5.1, against that of DOT 5. We would be interested to hear on our Facebook page from technicians that have ‘converted’ customer cars for their findings. 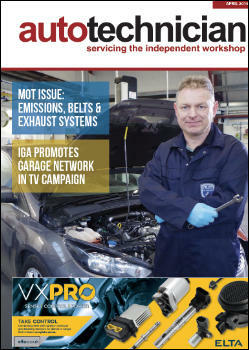 A number of garages use DIY-type brake fluid testers. These measure the conductivity of the fluid and utilise a traffic-light system to give an estimated water content percentage. Naturally, many companies looking to sell you professional testing equipment do not recommend that you buy inexpensive DIY testers. Our own independent tests reveal their advice to be correct. 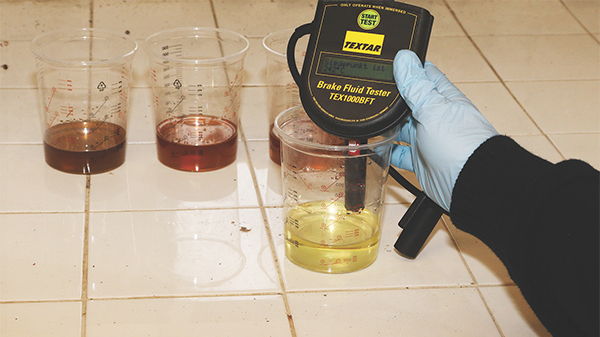 We evaluated five DIY-type conduction testers, using new DOT 4 brake fluid (which boiled at 242°C), a 12 month-old sample (210°C), one that was aged 18 months (192°C) and fluid that was five years-old (160°C). We obtained the official boiling figures by using a professional-quality Textar TEX100BFT, which collects and boils a sample of fluid, providing a more accurate figure than measuring conductivity and using algorithms. This allows the technician to compare the recommended minimum boiling points. 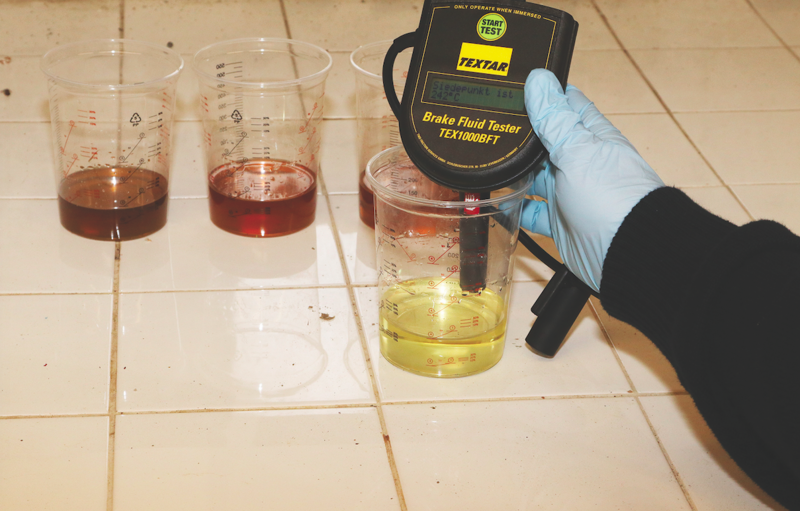 Professional brake fluid testers boil a sample of fluid. They are costly but should be viewed as an investment; not only can their use generate work, but they also provide you and your customer with critical safety information. The results were startling and a little worrying. The cheapest ‘DIY’ product rejected even the new fluid, whereas most of the others provided varied readings, when assessing the same fluid sample. Unsurprisingly, the best were the most expensive, being the Sealey VSO274 (£59.94) and the Laser 4875 (£50.35). Professional tools will give you an accurate boiling point, including the Textar/Mintex TEX100BFT (ask your local TMD friction supplier but expect to pay around £270) and the Ferodo FFT100A (again, ask your local Ferodo supplier for price and availability but expect to pay in the region of £300). All prices quoted include VAT and correct at time of press.